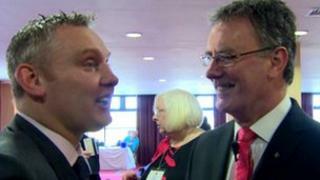 Strangford MLA Mike Nesbitt has been elected the new leader of the Ulster Unionist Party. Mr Nesbitt, 54, defeated South Down assembly member John McCallister by 536 votes to 129 in the contest at the UUP annual general meeting in Belfast. He said he wanted the UUP to become "the party of choice for every pro-union voter in Northern Ireland". "I want everyone in this country to get out of bed with a sense of purpose," said the former broadcaster. "I want this party to wake up with a sense of purpose. "I want us to reach out to become the party of choice for every pro-union voter in Northern Ireland, including those who still say they want a united Ireland, but privately accept there is no longer a single reason not to enjoy their continued membership of the United Kingdom." At the centre of the campaign was whether to back Mr Nesbitt's plan to remain part of the coalition Northern Ireland Executive and keep the party's one ministerial position, or to go into opposition as favoured by Mr McCallister. Mr Nesbitt takes over from Tom Elliott, who announced earlier this month he was standing down as leader after just 18 months in the job. Mr Nesbitt is a former presenter of UTV news. He began his career as a sports presenter at the BBC, and he anchored the flagship Good Morning Ulster radio programme for a number of years. At UTV, he presented its evening news programme for 10 years before leaving in 2006. He became a Victims' Commissioner in 2008. He left the commission when he joined the UUP in 2010.